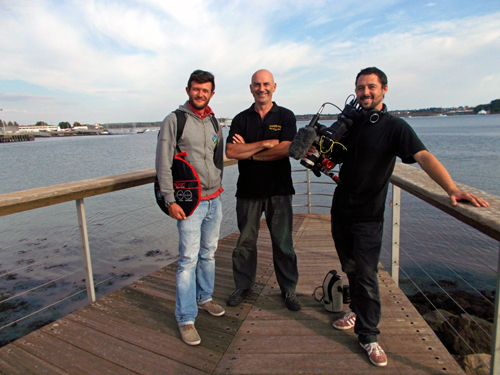 This Sept. 4, 2014, in Lorient, l'Expedition Scyllias team participated in filming the documentary « Les belles englouties » (Nice Sunken) that evokes the Breton submerged heritage. Several historically remarkable wrecks will be discussed in this 52-minute documentary produced by Aber images that will be initially broadcasted, beginning in 2015 on the Brittany channels Tébéo, TébéSud and Tv Rennes 35. 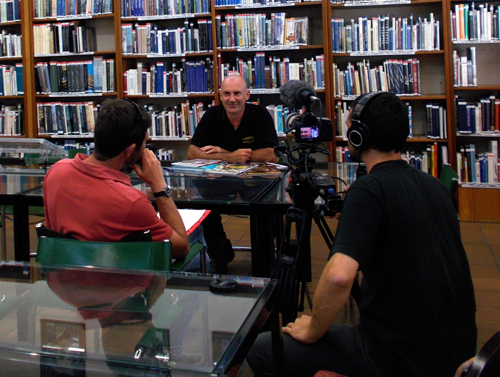 Jean-Louis Maurette interviewed in the service historique de la défense (National Defense History Department), in Lorient. The shooting, which took place all the day long, without interruption, were made at the former submarine base, the service historique de la défense and in different places in Lorient by the cameraman Yoann Coutault, under the leadership of director Christian Roche. L'Expédition Scyllias team was represented by Alain Vincent Gautron, Jacques Hellec and Jean-Louis Maurette. Christian Roche, Jean-Louis Maurette and Yoann Coutault.